Last night my friend Tim Lucas took the time to post comments to my recent entries, “Bubblegum Breakthrough” and “DIDs,” a gesture that I very much appreciate--one hopes that one’s blog entries are taken seriously by somebody. While I’d like to respond at length to the many ideas in both of his posts, for the moment I’ll confine my remarks to Tim’s remarks on my most recent entry, “Bubblegum Breakthrough,” simply because it’s the most recent. No wonder he [Kornfeld] . . . looks so blissed out while standing onstage and rapping to the ABC newsman about all the people sitting in the rain in the Woodstock movie. His rap is the one Charlton Heston has memorized in The Omega Man. 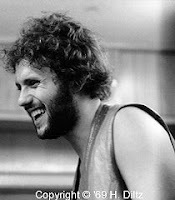 Having read Tim’s comment, it occurred to me that one could think of “The Rain, the Park & Other Things” as a sort of virtual rehearsal for the Woodstock festival itself, as if Kornfeld had, in some half-formed or perhaps unconscious way, the idea for the Woodstock festival in his head when he wrote the song years before, thus making the lyrical content an example of what rhetoricians call prolepsis—speaking of something that has not yet happened as if it already has happened. One wonders if Kornfeld being “blissed out” during the interview isn’t, in part, his own bewildered reaction to the literal realization that “The Rain, the Park & Other Things” was, remarkably, unfolding before him. The Cowsills may have been a bubblegum act by definition, but I would personally categorize their performance of this song as psychedelia. There is no insincerity or irony in the vocals, for one thing, and the instrumentation has a wonderfully iridescent quality. Wholesome yes, but psychedelic nonetheless--like a black light poster or a strawberry scented candle. I see psychedelic music as the aural equivalent of an hallucinogenic drug trip--“She’s a Rainbow” being the Stones’ answer to “Lucy in the Sky with Diamonds”--while bubblegum is the aural equivalent of non-alcoholic beer (or, alternatively, psychedelic music played by a band that doesn't inhale). I think the Cowsills’ (cleaned-up) cover of “Hair” also works as wholesome psychedelia--listen to the sound effects during the “It can get caught in the trees” stanza--but “Indian Lake” is unabashed bubblegum. Yes, and yes--although I was never a fan of the musical Hair nor the Cowsills (which doesn’t mean, incidentally, that just because I wasn’t “for” them meant I was “against” them). “Indian Lake” is on The Best of the Cowsills, but when I play that CD I usually press the “skip” button when “Indian Lake” cues up. To be honest, the only Cowsills record to which I really ever gave a listen was The Cowsills In Concert (which included “Hair” live), an album that a friend insisted I borrow, along with the first Vanilla Fudge album. I have to say that at the time, for some now long-forgotten reason, my tastes gravitated toward Vanilla Fudge, although the last time I listened to their first album (on CD), probably a year or so ago, I found it extraordinarily dull and turgid. Some critic once remarked about the work of the novelist Henry James, “He chewed rather more than he bit off,” a remark that is an apt description of the first Vanilla Fudge album. I probably thought at the time that it was “psychedelic,” but now I think it is just “pulverizedelic,” a plodding, Hammond organ-heavy album that is utterly devoid of any humor or imagination. You can’t imagine how many local bands at the time tried to copy its sound, bands that played so many high school proms I don’t even wish to think about it. 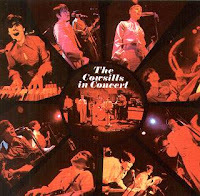 In contrast, and to its credit, The Cowsills in Concert is, now, what it was, then--completely innocuous and benign. Looking back at my previous post, I see that the fundamental issues became even more complicated when I suggested that "Power Pop" developed out of "bubblegum." Anyone wish to chime in on (for example), the relation between . . . the Cowsills and . . . Big Star? I wrote my comments about your blogs at an hour when I was sleep-deprived, as the time on them bears out. Consequently, while they are almost entirely what I meant to say, enough sloppiness or inconsistency slipped in for me to make the remark about irony being symptomatic of bubblegum music. I was thinking primarily of the Ohio Express and 1910 Fruitgum Company songs, as well as "Indian Lake" when I wrote that; and I guess irony isn't what I was reaching for so much as ingenuousness or forced naiveté. Thus, while "Indian Lake" fills the bill because it's a kind of musical commercial for the place, and thus a kind of billboard cluttering up the supposed unfettered beauty of the place (there's your irony, or my irony, as it were), "The Rain, the Park and Other Things" is characterized by the almost fantastical naiveté of its situation and genuinely enchanted by it. Another thing about the Stones and the SATANIC MAJESTIES album: in accordance with the notions I've set forth above, I must say I probably would file it under bubblegum before I would psychedelia and "She's Like a Rainbow" is a good indicator of why. The song is an acknowledged rip-off of Love's "She Comes In Colors," a great psychedelia song and one of greater depth and substance; with SATANIC MAJESTIES, an album I intermittently like, I think the Stones were being insincere and following a trend that didn't fit them too well. They saw this too, they've said, and went back to their rhythm and blues roots to make the best albums of their career. Finally, about Vanilla Fudge: I think we're basically in agreement here. Before heavy metal, there was heavy rock and Vanilla Fudge exemplified this with the hamfisted drumming of Carmine Appice -- hair/arena rock drumming decades before either existed. But I can't agree that they were without imagination. They didn't set themselves up so much as authors as interpreters of other writers' songs, and at least one of their arrangements -- of the Motown hit "You Keep Me Hanging On" -- is an inspired reinvention of the song that remains one of my favorite FM-extended tracks from the period. I hope this reads sensibly in the clear light of day, and that it will yield more grist for your (very entertaining) mill! When Arthur Lee was writing the songs for Love's classic FOREVER CHANGES album, he was convinced they were the last songs he would ever write because he was convinced he was soon to die. He recorded the album, which sold very few copies, broke up the band, and moved on. Forty years later, the album was remastered and reissued, rediscovered and greeted as a classic whose time had come, and promoted by Lee and a band of admirers in a series of concerts (a la Brian Wilson's PET SOUNDS tour) all over the world. Shortly after the end of that tour, he died. I think that's a textbook case of prolepsis.